Can quickly attach to the edge of a bench, a table, a piece of plywood or any flat surface. 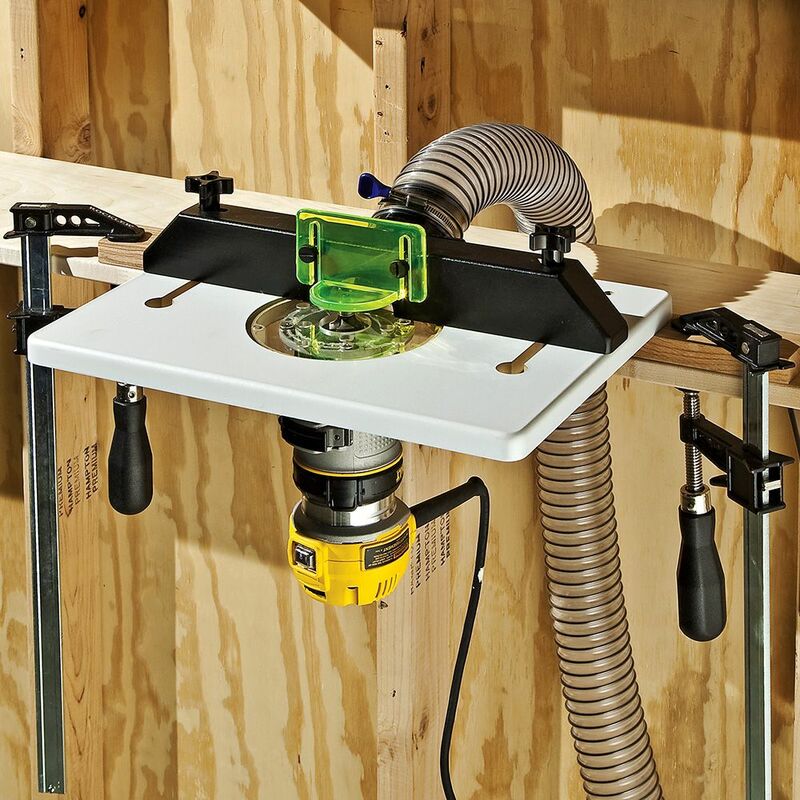 Get more out of your compact router with a rugged, adjustable Trim Router Table that goes anywhere! 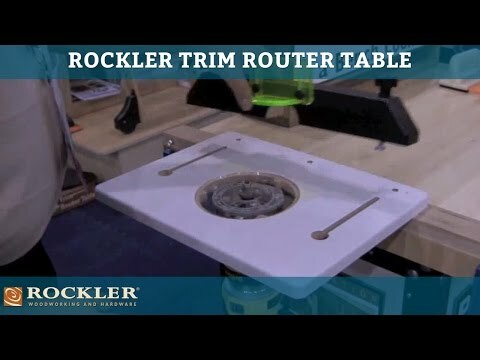 A Rockler exclusive, the Trim Router Table features pre-drilled holes on the back that let you attach a clamping strip for quick use on the edge of a bench, a table, a piece of plywood or the tailgate on your truck. 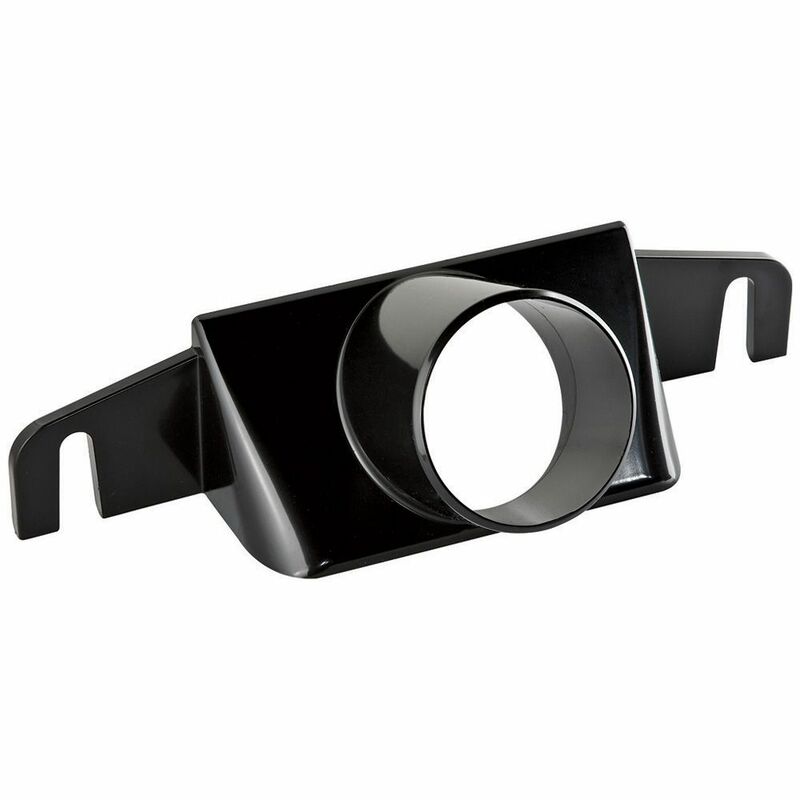 Perfect for small applications like routing round-overs, chamfers and small dadoes in your shop or at the job site. Sets up quickly, and it's just as easy to detach your router from the table without tools. Use your router with the included 1/4" thick acrylic base to do freehand work like a standard router. 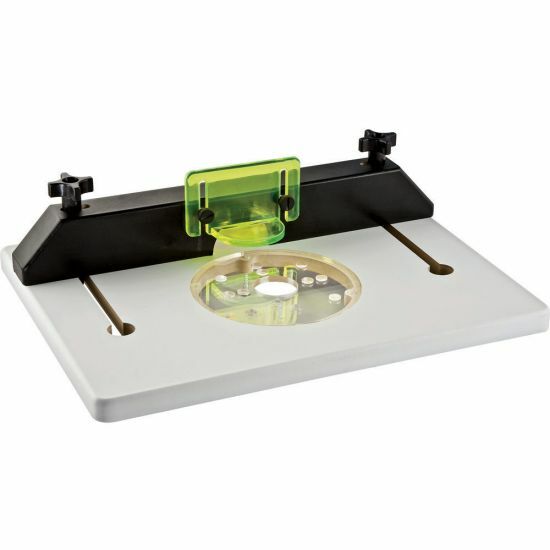 The acrylic base not only provides a wide, level base for freehand work, it's pre-drilled to fit most popular trim routers. 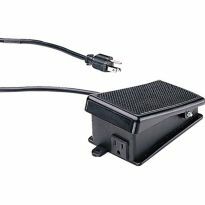 Also includes an adjustable fence that's compatible with the Rockler Router Table Dust Port (#21528, sold separately). Table Dimensions: 3/4" x 11-1/2" x 15-1/2"
Great table. Portable. Screwed a clamping jig to it so I can clamp it to saw horses, workbenches, even deck railings. Fits both of my DeWalt compact routers. Pre-cut shorter pieces work best, but with help from rollers, table extensions, or your son, longer pieces can be routed. Highly recommend for job site work. Planning to build a stand for it now. Great addition to the wood shop and router use. Gave this one as a gift to my son. Compact, easy to set up, use & store. Rocker is a Great company with great products and customer support. 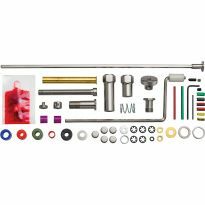 Great product all though once in a while when I order other item I’ve been have some product problems..
Good table for smaller or shorter workpieces. For the money, it doesn’t everything I ask of it. I put a bit of wax on it to help the workpieces slide. The only problem I encountered related to long workpieces, which tend to drop at the start, causing lift of the piece and resultant “beaver” chewing. Nothing I couldn’t fix, though. I really need an input support. Makes for fast work especially on smaller pieces. As an aside, the clear router base doesn’t have the holes for my compact Makita. However one hole is correct, so marking and drilling/countersinking 3 more is not a difficult task. Love the little thing. Perfect for my small shop. I have a modular workstation that allows me to add modules. I made it work and with the start/stop switch I bought I am now routing without the need for an additional table just for the router. 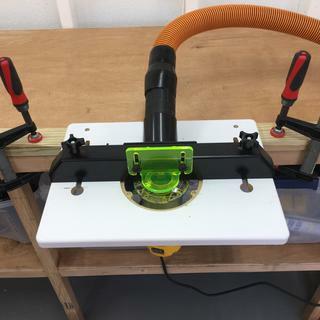 This little router table is designed to do exactly as it is advertised: provide an efficient, accurate, and economical option for those that don’t do routing projects frequently. This little guy works great with my Colt trim router. I just leave it in my bench vise and it's always ready. Great for small jobs, and I feel safer using it than my 3HP router in my table saw extension table for small parts. Love it!!! Using it to make rounded moldings. Does not take up any room. Works Great in small spaces. I don’t have room for a full table and this can easily be added to a workbench. 5 minutes and I was in action. Perfect for my Bosch Colt. I got this to use with my Ryobi trim router. The included plate is NOT predrilled for the Ryobi just so everyone knows. I knew this before buying it and was quickly able to drill and countersink the new holes for my router (with a hand drill). I started with small bit and worked my way up to the final size needed to not crack the acrylic. Otherwise, this thing is perfect for someone with limited space. Also, get the dust collector. For $10, it does a shockingly good job. Easy to assemble, works as described, much safer than trim routing by hand. Great little product, and very affordable. I added on a little board so it's easy to clamp to workbench (or any other surface). The new base is easy to attach to the router, and then it just goes in and out of the table. I have a cluttered shop and so pulling out the big router table is not always convenient for small jobs, and this totally solves that. I love it! Great for trimming veneer on small pieces. This is great add on to a small shop that needs multiple repeat routing tasks ready to go! I attached an 8/4 piece of wood to the bottom of the table to be held by my end vice. Works terrific. I tried freehand and was ready to give up on the adventure. The router was all over the place. Using the table I was able to make straight lines without much error. I still need more experience but it is getting way better. The fact that the face plate did not fit my particular trim router was not a problem. It was very easy to drill the holes necessary to fit my router. This table has been great for routing rabbits and dados as well as rounding over edges. 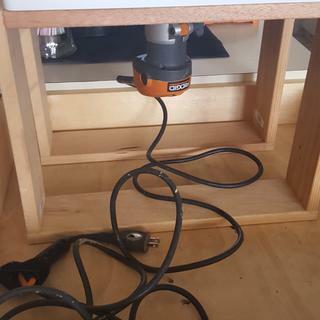 As a small router table it works excellent. This is the second table I have purchased. Has nothing to do with the quality of the table. The first one failed due to abuse. My only wish I should have bought a better router which would be easier to adjust the depth of cuts. Built well, excellent fence with dust collection connection. For light duty work, you should not be without this table. 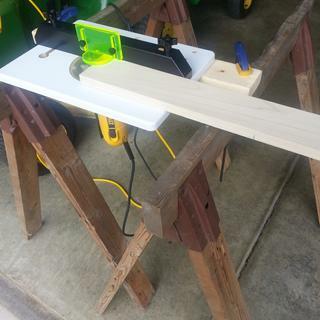 Works great with the compact router and portable folding work bench. 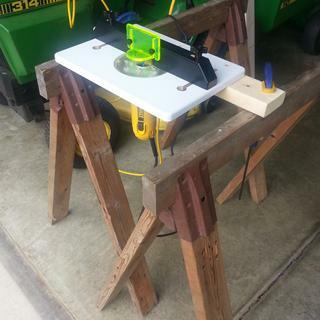 I attached the table to my table saw and it was easy. I did build a little center support from the side of the saw to the bottom of the router table that is portable.Works well Happy with the purchase. Great for working with small parts.works well with Dewalt 611 router. Would recommend this to all woodworkers. Thank you ?? Easy setup. 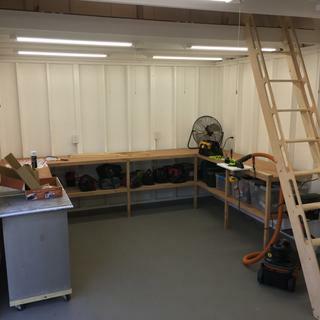 Great for a small space workshop. Easy to work with. An awesome little router table.. and cheap too ! Again, compact and fits all my dust collection equipment.. Simple to use and sturdy construction. This router table is just the right size for making wooden toys and scale furniture. The fence and bit guard are excellent. I have used a home made version for 30 years, but this one is a winner. Just got this and set up the jig... very easy and simple to dial in the settings for router plate alignment with table. 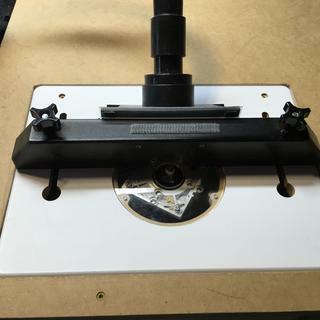 makes things very quick as opposed to pulling out my router table cabinet to do the quick small projects... and the convenience of pulling the router out and using it freehand with the universal plate will be a real convenience.. It is what it is for doing the small/medium tasks.. The only hang up is the universal plate for attaching didn't align with my Rigid compact router... which seems to be an issue with trying to get anything aligned with after market products... but a quick alignment with drilling got it to fit like a glove. I was just the right size for the small jobs. Very handy in a tight shop. Awesome for a tiny shop, I'm a decent woodworker and built my last full sized professional router table, built the precision fence system, dust extraction and even built a pro router lift, all on a mortise & tenon bench. We moved , downsized and a I have a 12x24 new shop and needed a small router table. This is perfect for basic shaper work, and with my dewalt611 palm router it's almost as precise as a real router lift. I may add a 3/4" guide just for fun from extra parts I have. The dust extraction is worth every penny and works brutally good, I ran 30ft of 44" boards with a 1/4" roundover bit and a RIDGID compact shop vac with a 1/4 cup of chips on the floor. 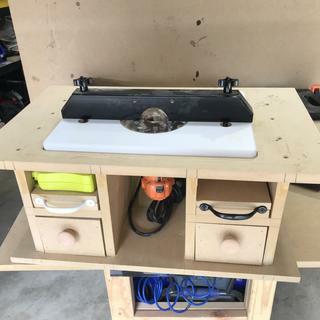 This table is a great option for anyone with a small shop as I have and/or also does job site work. Extremely accurate while at the same time being easily portable. Set up is virtually anywhere is easy. GREAT JOB (again!) ROCKER!! Great for small work pieces. Works well with my small trim router and adapted easy to the mounting plate. None of the holes would line up so i drilled my own. I wanted a router table but didn't really have room for one in my garage. This fits in my Black and Decker Workmate perfectly and actually made for the Dewalt trim router I already had. I made a picture frame with an inset and this worked perfectly. The dust collection option also came in very handy. For me this is just what I needed and does not take much space. This little router table is perfect for many small jobs. 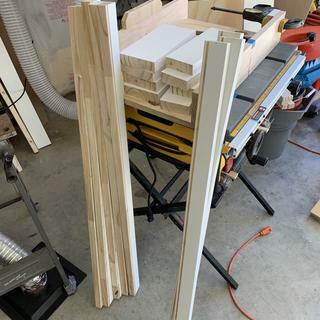 I attached a 3/4x3x24" piece of hardwood across the back of the router table and use that to clamp it to the workbench when I need it. It sits on a shelf when I don't need it and doesn't take up any working space in my rather small shop. I have had this table for 2 months now and love it. I have used it to cut slots in drawers and other light work. I had no problem assembling the table although the instructions could be a little clearer. This is not the table for you if you plan on doing heavy routing or lots of it, if this is you go for the larger router tables with the aluminum plates.Otherwise a great table even made better when you get it on sale. Great for small shop....& portable! I don't have room for a full size router table. This works great! When I need it I pull it out and clamp it on my bench. Used same idea from another reviewer and cut my support into a French cleat. When I'm done it stores neatly at the end of my bench.....out of the way. When not in use takes up very little space. 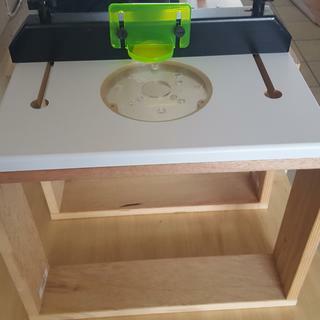 I purchased this as a smaller alternative to a traditional router table. I do mostly small frame and craft work, and didn't have the footprint necessary for a traditional router table. I recess mounted this into my worktop and it works perfectly for my needs. I mounted my Bosch Colt trim router to it and it handles everything I have thrown at it. I highly recommend this if you need a compact alternative to a traditional router table! 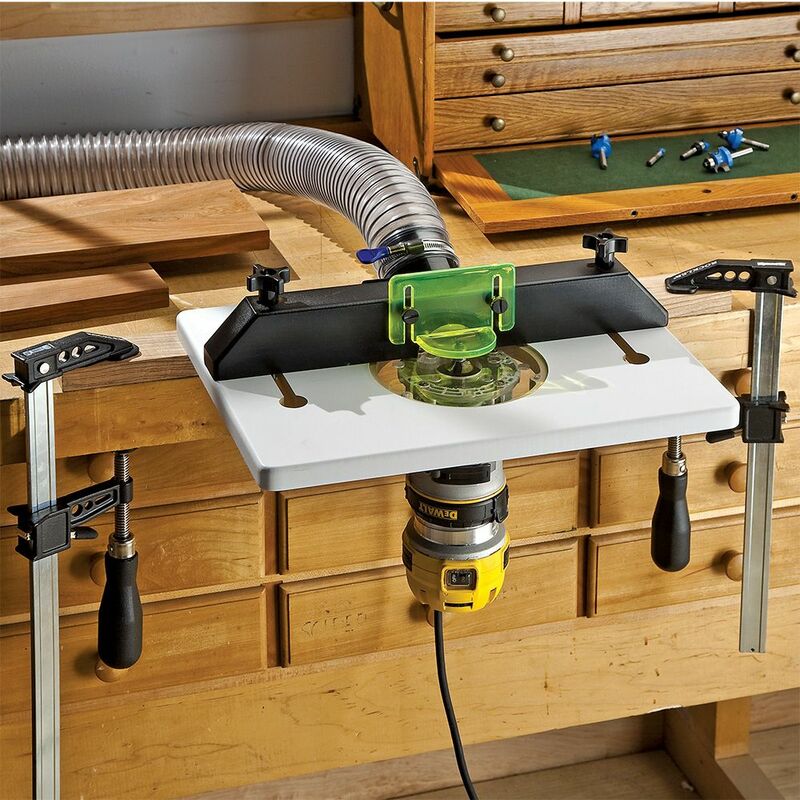 Rockler trim router table, built into work surface. Looks like it will meet my needs well. I wanted small, simple, portable. Its Looks nice and safe for small hobby corner. In future I will try for portable router table. I love all you product and you new concepts. Great Price and being its portable makes it good. Good reviews. Would be useful for Ryobi trim router. I use a trim router often and am hoping that this router table will allow me to make more clean and precise cuts. TO TRY IT OUT FOR SMALL ROUTING JOBS. DO YOU RECOMMEND ANY PARTICULAR ROUTER? I have some small jobs and the Router table has a lot of great reviews. I make temporary trim router tables frequently, most last a couple of weeks, and then I have to remake it. This should last much longer and at the sale price it's a no brainer. Looking for something I could use with a Bosch Colt I think this will work. It looked like the table that could be applied to different set up situations in my small shop. perfect for my small shop...I can keep one of my trim routers always set up in it for quick and convenient use. I don't have a large shop. At some point I will incorporate into a table. Primarily due to the space saving aspect. I don't expect to use it very often but when I need to rout something I want it to be professional looking. Have been informed by Rocker's Customer Service, this product with work with my Bosch 1.0hp Colt Palm Router. a good price and will see if its worth it. I have a trim router, needed another table, this was on sale. Portable size, works with my trim router. 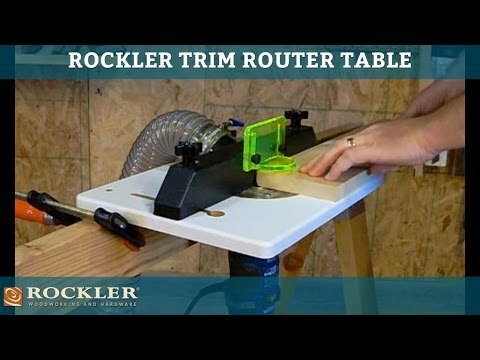 I was looking for a smaller table to work with my trim router. Because it's small and very portable. I can hang it on a wall when not using it and set it up in seconds to use it all day long. Perfect for what I need. Needed one, you have the best. I needed a fast setup small router table for some projects I am working on. Chose this the trim router table to use for off site work. Convenience. It looks like it is exactly what I need for small projects. Table routing is safer than freehand. Will the $29 Harbor Freight Trim Router, which has a square bottom, fit the Rockler Trim Router Table? BEST ANSWER: No. Only 2 holes match on the HF Drill Master 1/4 inch trim router. I had to drill 2 holes so 4 screws can be used to hold the Rockler circular plate. Not a big deal. It took me 30 minutes to do but it was worth doing. The final set up is solid qand works well. The square pattern does not fit that trim router, you have to drill your own holes. Does the pre-drilled base fit the Makita trim router? BEST ANSWER: The pre-drilled holex do not match up with the Makita 3709 laminate trimmer. does anyone know if a Makita RT 0701 Compact Router is compatible with this table ? I am in need of new base plate. can I just buy the base plate for this? BEST ANSWER: I just bought one via the customer service line. It is part #: 54166 and costs $14.99. Thanks this is great. I have ours in a class as I teach woods and the kids seem to break everything. 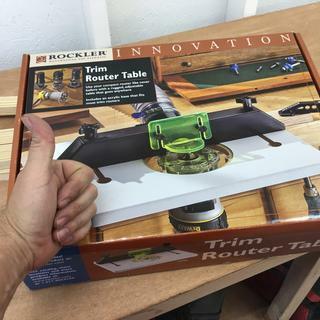 I asked at a Rockler store (Schaumburg, IL) if I could buy just a clear plastic base, and they said no. 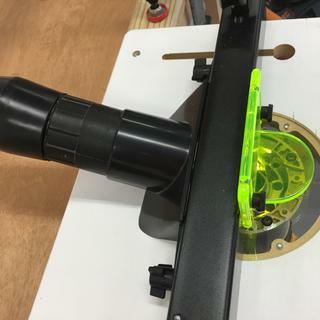 Wil this trim router table work with the RT0701C router? BEST ANSWER: No you have to drill new holes, and then be careful because I cracked mine drilling holes. 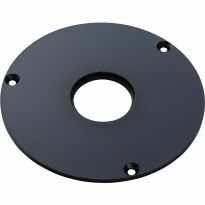 Will the pre-drilled mounting holes work with my 1/4" Drill Master Trim Router? BEST ANSWER: I really can't help, The one I found that works is a bosch palm router. I bought a trim router table, it comes with a insert pre drilled for some routers, but I have a Ridged router. It does not not have the pre drilled holes in the insert that will fit my router. Do you have either a another insert for the base or one for my router that will fit? BEST ANSWER: You have to drill it out yourself. Take your current base plate and tape it to the one supplied so you'll be able to layout the holes exactly (first thing I failed to do). Also, take your time with the drilling and don't push too hard, otherwise you will cause big shards of acrylic to chip out around the hole (second thing I failed to do). I also drilled new holes for my Ridged router. Used a forstner bit to counter-sink, but had to go really light and take my time with the drill. Had read about others who had cracked the plate doing the same. Just take your time and you will be fine. The supplied base did not match my router either. I just drilled new holes on the base plate. In my case I had to get some longer screws to fasten the plate to the router. Worked fine. Hi Phil, i had to drill my own holes into the base to make it fit my rigid trim router. witll this table attach to my Bosch 2.25 HP router. ? No, the title description says trim router. Yes it will. I use mine daily. Did it line up with base plate, or did you have to drill to get it to fit? What routers can you use with this? BEST ANSWER: I used the dealt 611-perfect mount. I followed the picture on the box. Don't know about all the rest but it fits my dewalt 611 perfectly. You can click on the technical drawing and get the dimensions for the mounting holes. It's predrilled for Bosch, dewalt and porter cable trim routers. But I drilled holes for my rigid and it works just fine. Is the router base fixed to the table or is the router removable? Does the bosh colt fit this table ? BEST ANSWER: Yes, that's what I have mounted on mine. Sorry, can't help you, I have the small Dewalt router. Yes it fits well. For small routing it iWork's well. Would it be prudent to seal the exposed MDF on this table (or on any other Rockler jigs)? Epoxy? Shellac? BEST ANSWER: I can't imagine a scenario where the table would be in much contact with water. You shouldn't have to seal the MDF on the underside. It won't hurt but unecessary. Will this fit onto a Dewalt table saw? BEST ANSWER: This is a stand alone part that I clamp to my workbench. I would say it is not designed to act as a router insert. 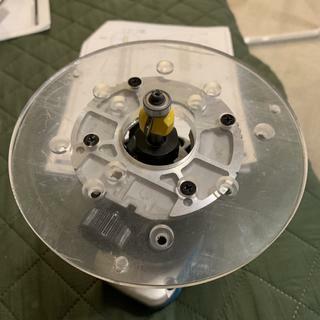 If you want something that works with an extension wing from a large circular saw, not one of the contractor job site saws, you should buy one of the router table inserts that Rockler or others make. Not really. Its designed to have you add your own piece of wood to it and the either permanently mount it somewhere or use clamps for a temporary mount. Will this work with the Harbor Freight Trim Router? In the feature listing, it states the following comment. "This product does not work with item Bosch Colt 1.25 HP Variable Speed Palm Router w/LED (#57485)" What is the reason for this? BEST ANSWER: The new Bosch 1.25 H.P. 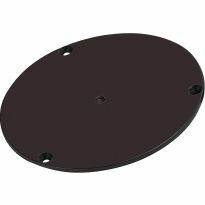 Colt router uses a 3-hole mounting pattern for the base. 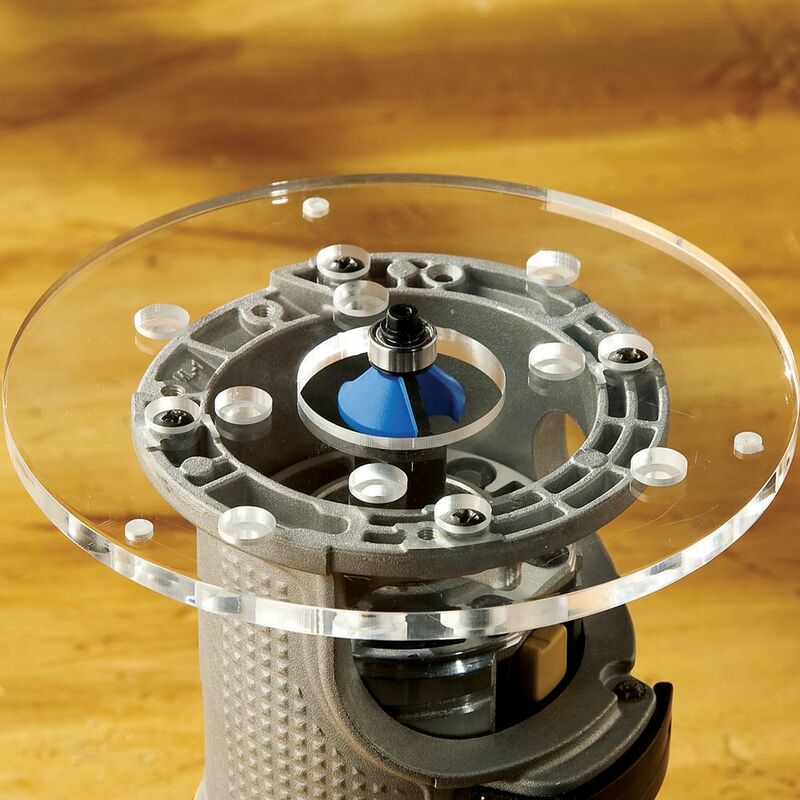 The acrylic insert is predrilled for the original Bosch Colt router. Our product development group is aware of this issue and is working to resolve it. I use mine with a Bosh Colt single speed palm router and it works fine for small work. 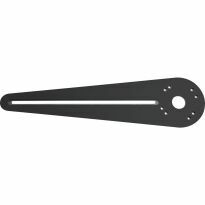 Actually, I have routed many Native American flutes sound and wind chambers with a 3/4 bit with no problem. Hope this helps. Which T-Knobs (OK, I know ¼-20) but male or female? Is Router Table Fence drilled to accept? BEST ANSWER: Male and mine had the appropriate holes. Does anyone know if the quality of this router table been improved upon since it first came out? There seems to be questions on the quality of this item in the past. BEST ANSWER: I have used the table several times since I bought it. And it performs well for what it is. Certainly not in the same field as a full blown router table, but does well for a quick setup for a small job. The work that I do is not "heavy duty"/daily use...but for small jobs, it has worked well for me. I have to attach it to a portable work table. Can you route a strip into the board to put a universal T strip in it? BEST ANSWER: Are you talking about adding a miter slot? Not worth the effort. 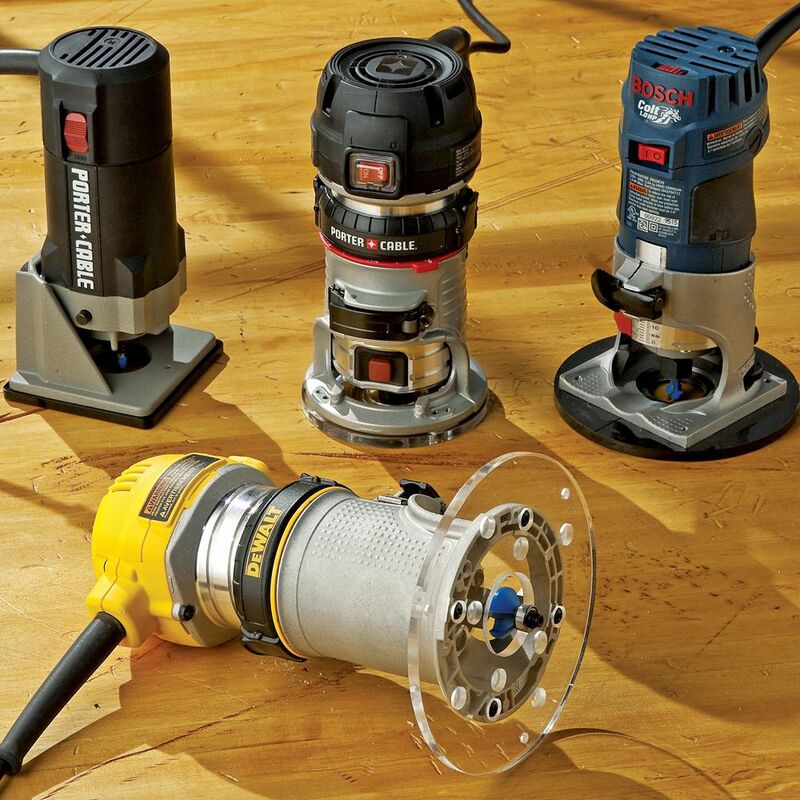 Get yourself the basic router table package and you’ll thank yourself later on. 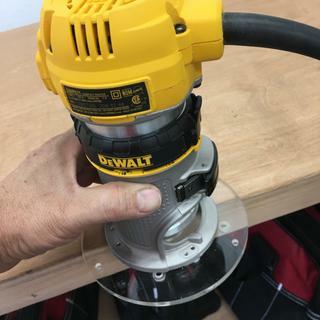 Will this work with all dewalt laminate trimmers? Sorry, I don't use laminate trimmers. My Skil 2 1/4 HP router does not work with this router table. The plates are too big. Is there a solution for this? BEST ANSWER: I would not recommend using your 2 1/4 HP router with this table. It is a specialty table and scaled for trim routers. It is smaller and I don't believe would safely carry the weight of a full size router. It does work well with my trim router. Will this table accommodate the Porter 693lRPK? BEST ANSWER: I can not answer since I have no knowledge of the Porter. I returned the table as it was to light weight for my purpose. This router table is really made to attach "Trim Routers" to it, I would be VERY hesitant to use it with a full size router. In addition that I'm pretty confident that the "router insert" will NOT accommodate a full size router, only the smaller trim routers. Makita is name brand. Why do they not have holes for it? BEST ANSWER: Hello I myself own the same router I had to make some adjustments and retap and countersink some holes and it works great. Enjoy hope you figure it out..
Will the 1 hp Bosch colt work with it? BEST ANSWER: I have the new Bosch Colt 1.25 HP, and I had to drill two more holes in the clear plastic base that fits in the router table. No problem. Thanks David,guess I will go ahead and order one next. BEST ANSWER: Yes. I use my DWP611 on this trim router tsble. Will this work with Bosch routers?